The article posted here was originally published in Volume 13 No. 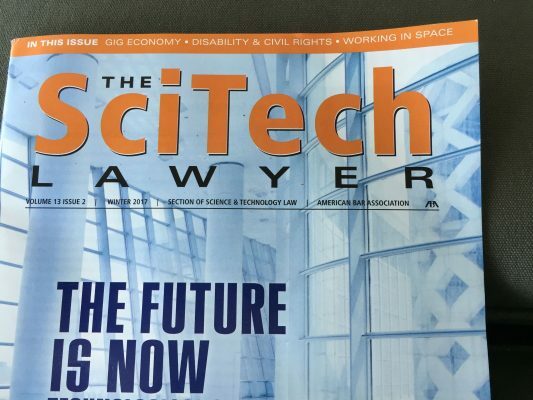 2 (Winter 2017) of SciTech Lawyer, a print and online publication of the Section of Science & Technology Law of the American Bar Association. The issue was devoted to legal subjects arising from the gig economy. Lainey wrote about how the new economic structures need digital accessibility and other disability rights issues. The gig economy: Flexible jobs! Extra money on the weekends! A quick ride (don’t worry about parking)! Meal delivery at your fingertips, and task rabbits to mow your lawn or build your Ikea furniture. Paralegals when you need them, no excess payroll when you don’t. “Feel at home” anywhere in the world—no hotel workers needed. The gig economy is no longer an economist’s theory. It is real and growing, swallowing up service delivery and more in many business sectors. Today, the term “gig economy” describes an increasing number of modern economic relationships in the United States and around the world. Where do disabled people fit in? Disability rights are implicated by new economic structures; the law is beginning to take notice. Our journey through the gig economy from a disability rights perspective begins with a basic question: how do disabled people use the technology that is the foundation of today’s flexible and creative economy? Accessibility, when it comes to digital content, refers to development and design that allow disabled people to consume and interact with websites, mobile applications, and other digital technology. The short answer to the question many readers may be silently asking themselves is yes! Disabled people, including blind people, can use today’s digital tools. But only when websites, mobile applications, and other technologies are designed and developed with accessibility in mind. Not everyone can hear. Accessible websites and mobile apps provide captions for all video content. Many people cannot use a mouse. Accessible sites and apps can be navigated by keyboard only. Put your mouse away for 15 minutes and use only the space bar, tab and enter keys, and up, down, left, and right arrows. You will quickly discover which site owners have thought about accessibility. And remember, some people cannot use either a mouse or a keyboard: accessible content is available to those who navigate with their voice or in other ways. Blind people, and the one in 12 men who are color blind, either cannot see color at all or cannot distinguish between certain colors. Accessibility principles remind developers and designers not to use color as the only means of conveying information. The light gray text on a white screen that is so hard for so many to read? Accessibility principles embrace color contrast requirements that enhance readability for everyone. Accessible websites don’t have the blinking and flashing content that annoys everyone, because for people with certain cognitive disabilities or epilepsy, those annoying features render sites unusable. With accessibility in place, jobs, information, and services are available to more people. Here are just a few of the many ways accessibility and the law intersect in today’s gig economy. Mobile payments are a major engine of the digital/gig economy. A customer’s ability to pay instantly through a mobile application makes on-demand services possible. And not just on the customer side. Payment processors offer pay-on-demand options for gig economy workers too. Accessibility is critical to payment systems because without it, privacy and security are threatened. So many of my accessible technology cases begin when untrained staff ask a blind person, “Can’t someone read that to you?” or “Don’t you have someone who can help you with that task?” Independent access is a civil right, and most blind people don’t walk around with sighted help to do tasks for them. The need for independent access is easy to understand when the task involves money. Accessibility is critical on all sides of the equation because technology is integral to today’s workforce. Countless jobs require use of specialized software. A host of employment-based information, including recruiting websites, job applications, training and onboarding materials, and insurance, payroll, and benefits information is online. If job-related software and information is not accessible, disabled people can’t do the job. The accessibility of all digital facets of employment is drawing legal attention. Digital accessibility is crucial to educating and preparing today’s workforce and consumers to participate in the gig economy. There is significant legal activity underway to make sure the right to education is protected in the digital age. On October 3, 2016, the DOJ made public its “Findings and Conclusions Based on Its Investigation under Title II of the Americans with Disabilities Act of the University of California at Berkeley.” The investigation began with complaints from the National Association of the Deaf about video captioning, and expanded to accessibility issues of blind and mobility-impaired content users. The DOJ is not the only federal agency focused on accessibility. In June 2016, the DOE announced it had reached settlements with education organizations in Alaska, Montana, New Mexico, Nevada, Oregon, Utah, Washington, and Guam to ensure website accessibility for people with disabilities.3 News outlets have reported more than 300 open investigations by the DOE on similar issues. While we can expect a weakening of enforcement efforts with the new administration, advocates will continue to enforce disability rights laws in the digital space. Are you training today’s gig economy workers—or the next generation? Accessibility must be a core component from the start. Accessibility ensures privacy and confidentiality—core values of today’s healthcare delivery. Whenever I see the #HealthIT or #HealthTech hashtag on Twitter, I wonder: is the newest resource, gadget, wearable, or ingestible delivering accessible information? If it isn’t, potential customers are left out. Conduct an audit of all technology and every information source (web, mobile, email, learning platforms, employee software, etc.) for accessibility. Develop a remediation plan to remove accessibility barriers. wrong and less money is spent fixing errors. Put someone in charge of accessibility, just like someone is in charge of security and privacy. Give that person authority and listen to what he or she says. Add accessibility requirements (including accessibility testing) to requests for proposals and vendor contracts. Be specific. Check deliverables to make sure contract requirements are met. Assess internal resources; consider hiring a consultant, at least for the short term. Become part of the accessibility community. Most major cities have accessibility meetups, and many have accessibility camps. Follow the #a11y hashtag on Twitter—it is short for accessibility (a followed by 11 letters and then y) and is used by many leaders in the field. Go to accessibility conferences. Take advantage of free information. The websites of the WAI (w3c.org/wai) and many accessibility consultants are a treasure trove of good—and free—information. Your colleagues are benefiting from this information. Develop relationships with disabled people in your community. Invite them to public events; hire them to give feedback on products and speak to your teams. Learn from your peers. Humana is a leader in accessibility in the healthcare space, Bank of America and E-Trade in finance; Major League Baseball is far in the lead in sports. Tell the world what you are doing. Post an accessibility information page. It will help you gather feedback and, in my experience, help you avoid legal troubles. You can find a list of such pages from some of the largest organizations in the United States on my website (LFLegal.com). Anyone can become an accessibility champion. Do your part to make the promise of the gig economy available for everyone. This is an article that was published in a magazine for lawyers interested in science and technology. It is about how disabled people need access in the new gig economy. Mobile apps must be designed with accessibility so disabled people can use them. People with disabilities have a right to privacy when they go online. Disabled people are both customers and employees. This means all companies need to train staff about disability issues. Back to the top of this article.